I’m pleased to update this post to announce that the 2019 San Francisco Silent Film Festival will conclude Sunday May 5, with a 8:00 pm screening of Buster Keaton’s second feature comedy Our Hospitality (1923), to be accompanied by the Mont Alto Motion Picture Orchestra. Now that Buster’s complete silent film oeuvre is available on Blu-ray, and more historic Hollywood photos become available for study, we continue to learn more about how Buster crafted his amazing comedies. 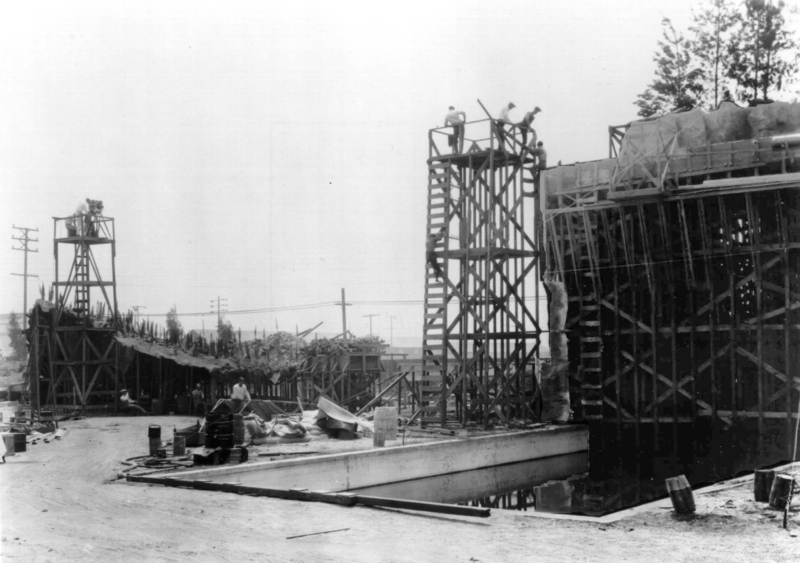 For one, Buster filmed scenes from Cops (1922) at three other studio backlots, including the original Metro Studios next to his own small studio, the pre-MGM Goldwyn Studios in Culver City, and the former Brunton Studios on Melrose, now part of current-day Paramount site. The Brunton Studio featured a unique “T” shaped concrete pool that Buster employed for two iconic water stunts; the once-lost high-dive gag from his 1921 short comedy Hard Luck, and the waterfall rescue stunt (above) that climaxes Our Hospitality. During the climax of Hard Luck, Buster climbs a high diving platform, and hoping to impress the bathing beauties assembled to watch, performs a swan dive so far from the tower that he passes the far edge of the pool, and smashes through the brick deck creating a crater. The women peer deep into the hole, unable to see where he has gone. 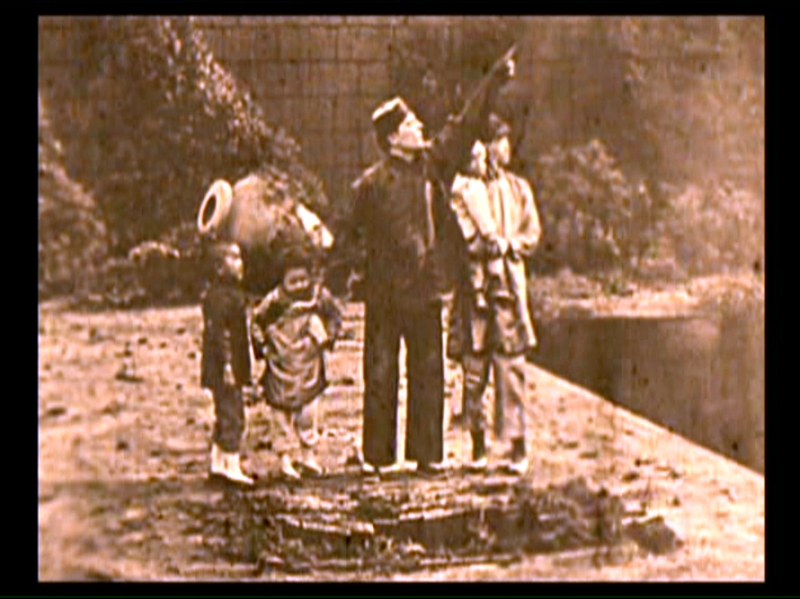 In what Buster would later recount as his biggest laugh-getting gag ever, years later Buster climbs back out of the crater wearing Chinese garb, followed by his Chinese wife and their children. Once considered lost, in many versions of the film the movie fades out just as Buster attempts his dive. But newer releases show the gag play out fully (see above). 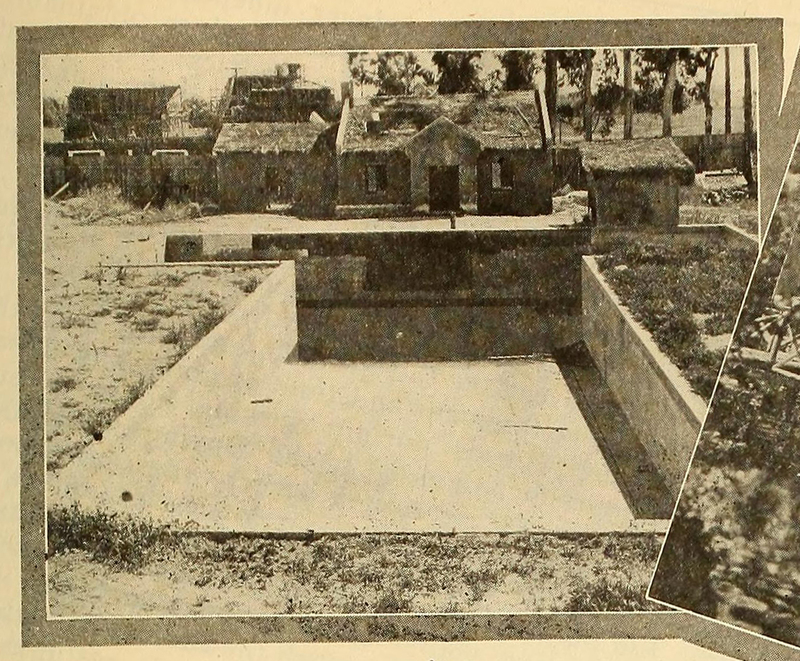 As Buster describes the scene in a 1929 interview, the left base of the “T” shaped pool was covered with thin wax painted to look like brick, allowing Buster to safely dive into pool deck. As discussed in the comments below, Buster’s trajectory during the dive looks odd, and the scene cuts just as he touches the deck. Perhaps animation or some other effect supplemented the shot – perhaps what we have available today is an alternate take, while the footage of Buster filming the dive “for real” remains lost. In any case, the dive could only be staged as a true stunt with the arm of a “T” shaped pool covered over, which is precisely what Buster set up. Three years later, Keaton returned to the Brunton plunge to film the truly death-defying waterfall stunt from Our Hospitality. A side view of the Our Hospitality waterfall stunt set, built over the “T” shaped plunge at the Brunton Studios on Melrose. 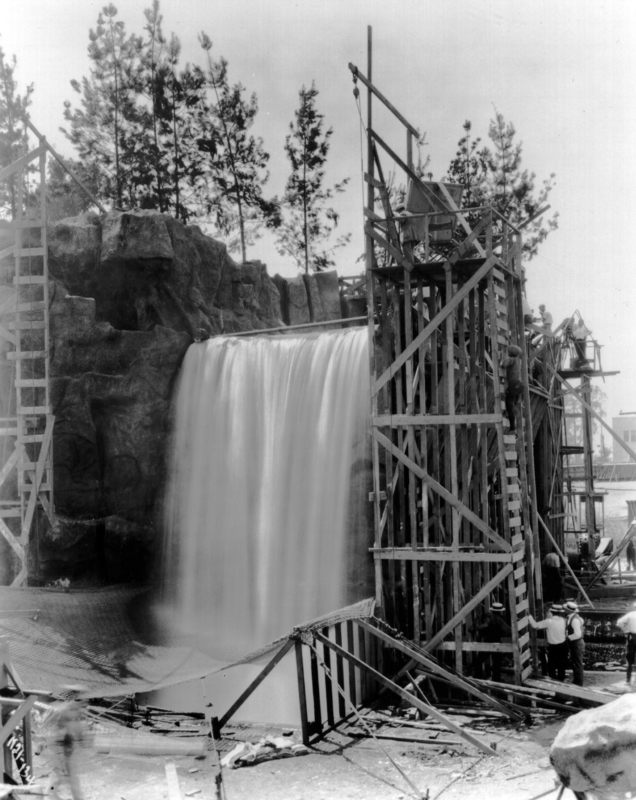 The miniature hillside set standing to the left appears behind Buster during scenes filmed at the brink of the falls (see below), creating the illusion that he was far up off of the ground. photo Photoplay Productions Ltd. The miniature hillside behind Buster is a set, apparent in the prior photo above. During the climax of Our Hospitality, Buster rescues his girlfriend, played by his first wife Natalie Talmadge, from sweeping over the brink of a waterfall by swinging like a pendulum from a rope tied to a log jammed in the rocks, grabbing her just as she starts to fall. Buster’s waterfall stunt set was also built astride the special “T” shaped pool that stood at the Brunton Studio, readily apparent in these behind the scenes photos above and further below. 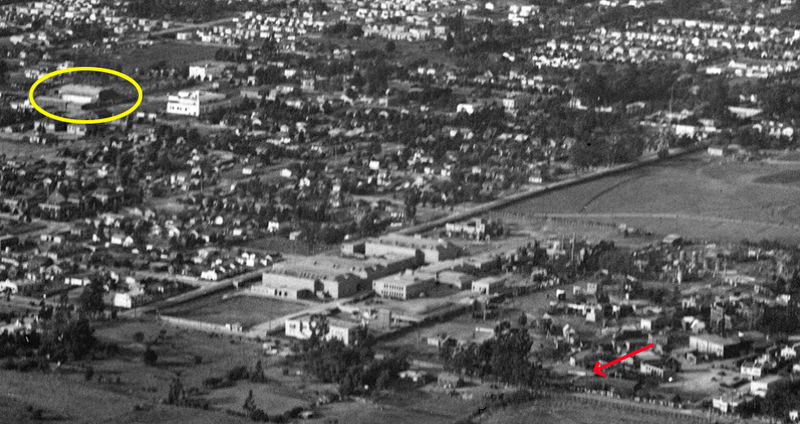 The Brunton Studio plunge was located just north of Melrose, due east of the modern Windsor Boulevard entrance gate to the Paramount Studios. Buster’s small studio, at Eleanor and Lillian way, stood just a few blocks away. 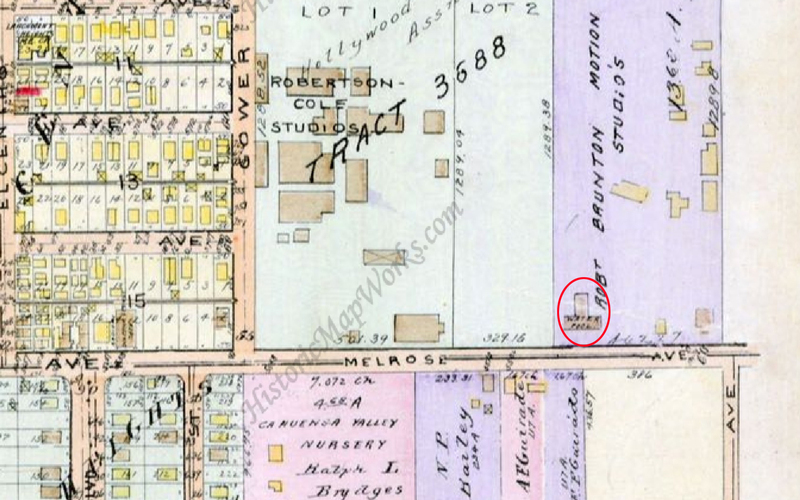 The orientation of the “T” shaped water pool, just north of Melrose, between where Windsor Boulevard and Irving Boulevard (neither yet plotted on this 1921 map) would later terminate at Melrose. The Robertson-Cole Studios and Brunton Studios depicted here are now all part of the modern Paramount Studios site. A view of the empty plunge – The Photodramatist Magazine September 1922. A front view of the Our Hospitality waterfall stunt set, looking west. photo Photoplay Productions Ltd. These shots from Our Hospitality of Buster scaling a cliff, left, and nearly falling from a cliff, center, were filmed on the waterfall stunt set, with the camera placed on its side, a technique frequently used during the 1960s Batman TV series, as Batman and Robin “climbed ” the face of an office building. The true image appears to the right. 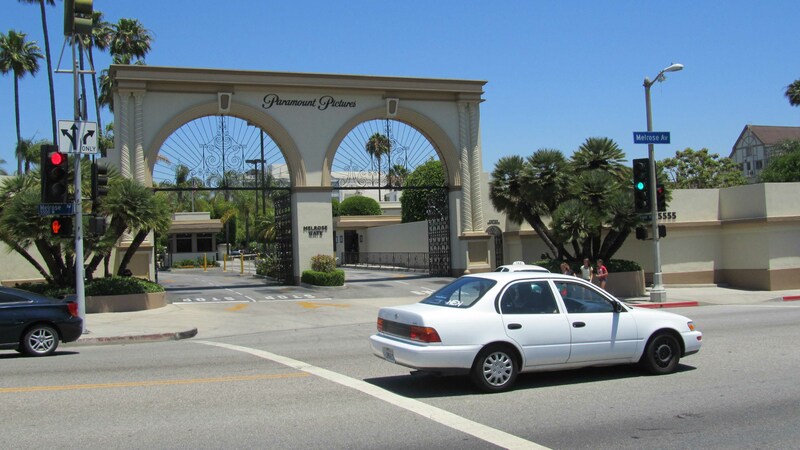 The Paramount Studios Melrose Avenue gate across from Windsor Boulevard. The Brunton Studio plunge once stood on the lot to the right (east) of the modern gate. Our Hospitality and Hard Luck licensed by Douris UK, Ltd. Special restored version of Hard Luck copyright 1987 The Rohauer Collection. 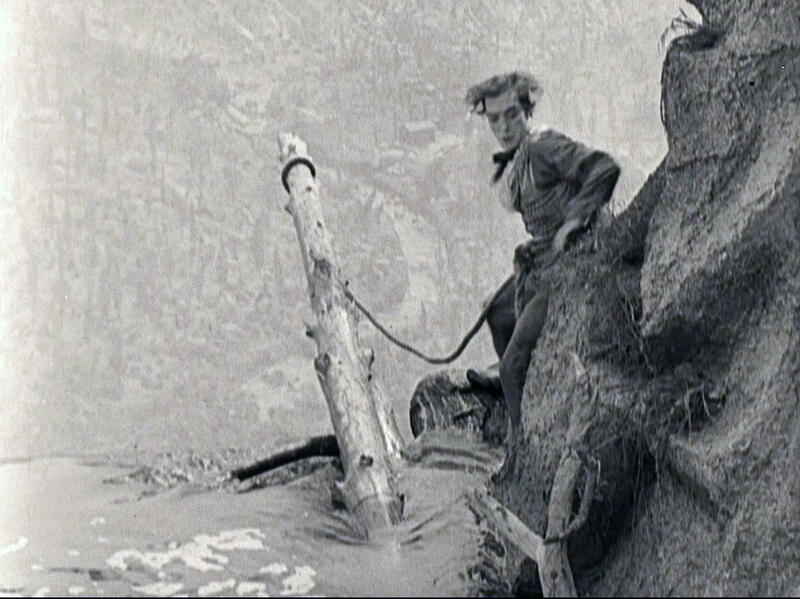 This entry was posted in Buster Keaton and tagged Buster Keaton, Hard Luck, Hollywood Tour, How Buster filmed Our Hospitality waterfall stunt, How Buster Keaton filmed waterfall stunt, Keaton Locations, Our Hospitality, Our Hospitality waterfall stunt, Paramount Studios, Silent Comedians, Silent Comedies, Silent Movie Locations, Silent Movies, then and now, waterfall stunt. Bookmark the permalink. You have to give Keaton credit for a lot of gutsy stunts. A lot of brilliant ones, too! There are still too many of his works I haven’t viewed yet, including the ones you touched on here. Paramount Studios ought to place a memorial on the site of Brunton Studios. It’s part of the cinematic heritage. I remember when I saw the dive from “Hard Luck” for the first time – I was bitterly disappointed that it was animated. I had read stories about this crazy stunt…it was supposed to be real!! I rolled back and forth over the footage, hoping it was a trick of the eyes. But nope – Buster’s image is definitely scooted. I was gutted. I want to point out that it IS possible that Buster made the dive for real. Since they shot 2 versions (one for American theaters and one for European theaters) it’s possible that he made the jump on the American version but was so freaked out by it that he politely and shakily declined to shoot it for the European film stock. He’s related stories about that jump…he stated that he never would have done it except for a gust of wind that blew him off the diving board. I’m fairly certain that the only “Hard Luck” version we have is the European version, so it is very likely that Buster said, “No way…let animation do it for the Europeans.” and went off for a Scotch. straight up. Hi Anny – I had not thought about it being filmed both ways. It seems odd that instead of filming at one of the many “normal” rectangular studio plunges, they filmed at one that was uniquely “T” shaped, but then covered up the base of the “T” to make it look like a rectangle. Why go to all that trouble? The only explanation that made sense, before I saw the “lost” footage, was so they could cover up the base of the “T” with paper for Buster to dive through. A low-tech, high-stunt solution Buster would seemingly favor. Your theory explains both the odd choice of the pool, and the odd animated look of the dive. However, … didn’t they usually have two cameras filming side by side, at least for stunts? 🙂 I guess we’ll never know. Sometimes they did the cameras side by side, but often on they would simply shoot the scene again. You can see the differences in timing on the precious few “alternate” scenes that have cropped up. There are some side by side footage on YouTube that I can direct you to…it’s amazing to watch the differences. Yeah…we’ll never know for sure if Buster really made that dive into the paper. He did talk about making that dive, but he’s been known to embellish on a few occasions. 😉 But you’re right…why would they use a “T” shaped pool? There were plenty of other pools that wouldn’t have had to be rigged with paper. Why go to all that trouble if they planned on using the animation department to fake it? We’ll keep our fingers crossed and hope that the other version shows up in someone’s attic some day. This is one of the contradictions that will always bother me. It’s such a small detail…but OH wouldn’t it be amazing to see the real dive???? I don’t think we’ve ever had a thread devoted to these unsung heroes of film. I guess I’ve watched a lot of films of late that have involved stunts and it got me thinking about the stuntmen and women. And about which actors did their own stunts, like Buster Keaton. Was he the exception? Were their other stars which insisted on doing their own stunts? Would the studios and insurance companies allow them too? And who were the men and women who did these stunts? Did each star have their own stunt doubles or did the studio have a stock company of men or were they freelance? Not the best way to start a thread with lots of questions and not much information but rather typical of me. Does anyone have any information or stories about the stunt men and women? My pet theory is that the gag as originally planned didn’t work; when he dove through the wax, there would be a visible splash from the pool beneath, ruining the gag. But I guess we’ll never know.